Pure accident. I had just returned home from a year teaching English in Japan. I had planned on getting a Master's degree in Japanese Literature, but was not able to get back to the US in time to start for the fall semester. While I was waiting for the next semester, I looked around for a job in Las Vegas, where I had temporarily settled because my family lived there. This was the fall of 2007, and Bauman Rare Books was hiring staff to open its new gallery in the Palazzo. It didn't take long before I knew I had stumbled quite innocently into the perfect job for me. And at Bauman, I benefited from the old-school apprenticeship model, in addition to a quick turnover of books (allowing me to see multiple copies of a single title in a short period of time), and many customer interactions in a retail environment. Thus a better initial answer might be: pure serendipity. I left Bauman in early 2016 and spent some time drilling down on the manuscript for my book, Printer's Error. But soon I was craving the rare book trade again. Heather O'Donnell and I are friends from back when we were both at Bauman, and would often grab dinner when I was in New York. We share a similar philosophy about the book trade. 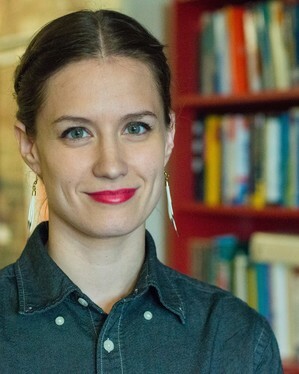 When I left Bauman, Heather saw that as an opportunity and opened up a dialogue with me. We arranged for me to collaborate with Honey & Wax from my home in Philadelphia. (I had moved there in 2014 to manage Bauman's central operations.) I visit Brooklyn once a week, but I work mostly independently, researching, buying, cataloging, and selling. In addition I lend another hand and eye towards general Honey & Wax projects, like book fairs, catalogs, buying for stock, etc. I feel lucky: we are good friends who also happen to work very well together. On any given day I can wear many hats. I am most likely to be hunting and researching books to buy, cataloging books we've bought, or discussing and selling these books with clients. But the amount of time I may spend in a day on any single one of these tasks varies greatly. I love the research. It doesn't take much for my curiosity to turn into obsession. In many other situations, this susceptibility to enthusiasm (my euphemism for "obsession") can be counter-productive. But the kind of cataloging I do means leaving no stone unturned, so this otherwise questionably helpful instinct can be mustered to good use. I am easily fascinated, and not so easily bored. The book I felt most honored to handle was a first edition of Newton's Principia Mathematica (1687) in a contemporary vellum binding. It had these yapp edges...it was a thing of beauty. But often I feel that the favorite item I've handled is whatever I've cataloged most recently. I'm always fresh off some new discovery that has pleased me in some unexpected way. Another recent favorite is an amusing Victorian-era entomology primer called Episodes in Insect Life. The work depicts anthropomorphized insects. Fine; Jiminy Cricket is familiar to us. But these are remarkable: the cricket turned into the weary author, a butterfly as a "painted lady," a bee doing "Apian Phreno-Magnetism." Let me say that again: bees, practicing phrenology and mesmerism. Don't ask me that question. I hate that question. It encourages me to do something I work very hard not to do (against my natural inclination). Instead, I feed that impulse into collection-building with my clients. I recently put together a collection of great spy novels and, even though I thought this genre wasn't my thing, reading and researching these books has turned out to be surprisingly satisfying. I prefer this type of collecting, which also happens to keep me fed. Besides reading, yes? That's obvious? I've found I need frequent physical activity, or I tend to get lost in my head rather too often. I do Krav Maga and try to lap swim regularly. I'm also partial to video games, which I know is a rather unpopular stance in our world. You can argue the merits of that last choice with me if you're inclined, but play Portal first. Then tell me if you still feel that way. I see a lot of pessimism and bewilderment in the trade, but I also see a lot of people doing interesting new things. I recall a conversation at the Boston ABAA fair a couple years ago with a brilliant and respected member of the trade, who has been selling books for over four decades. He was shaking his head, saying, "I don't know what your generation is going to do." My response: "I am bursting with ideas." And I'm definitely not the only one. It's not easy - it takes work, real expertise, vision, and resources - but the possibilities of what one can do in the trade are as exciting as ever. I created a podcast with author JP Romney called Biblioclast, a sort of book club for iconoclasts. Which is to say: we talk about classic books from a place of affection, but we also aren't looking to pull any punches in our discussions. Each episode is on the short side (10-15 minutes), so they're meant to be quick, digestible biblio-candy. New episodes will drop in March. The featured book: The Handmaid's Tale. 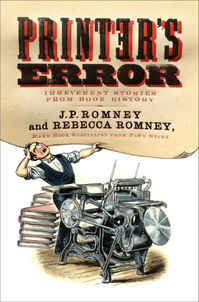 JP and I also co-authored a book about books called Printer's Error: Irreverent Stories from Book History, forthcoming from HarperCollins on March 14. That's just after the New York Book Fair. It's meant to be an introduction to the major themes and topics in print history, through the lens of individual figures' absurd, ironic, or just plain crazy life stories. For example, one chapter follows William Blake's invention of illuminated printing, the medium in which he printed most of his own poetry, and which he claimed to have learned from his recently deceased brother in a dream. The book is meant for a general audience, rather than the book history community directly. For this reason, we've taken a tone of levity throughout (but with over 800 endnotes because I can't help myself). JP's particular strength is as a comic writer, so it's influenced as much by John Oliver as it is A.S.W. Rosenbach. On March 15, we are having a book release party at Community Bookstore in Brooklyn, co-sponsored by Honey & Wax. If you're in NYC, please stop by; I would love to have you. I'll also be at the Rosenbach talking about the book on April 27. You can read more about Printer's Error on my website or pre-order it here. Or start by reading the current issue of Fine Books & Collections: an excerpt from the book is the cover story.